Warping into syndication in 1987, Star Trek: The Next Generation successfully launched its seven-season "continuing mission" of the starship Enterprise, and this classy DVD boxed set gathers the show's inaugural season in crisp picture clarity and dazzling 5.1-channel sound. A ratings leader with a sharp ensemble cast, this revamped Trek honored series creator Gene Roddenberry's original Trek concept, nurtured by returning veterans like producer Robert H. Justman and writers D.C. Fontana and David Gerrold. Several first-season episodes have original-series counterparts, and while the season was awkwardly inconsistent for all involved (including Roddenberry's heir apparent, producer Rick Berman), in retrospect the series began on remarkably solid footing. Star Trek: The Next Generation would become one of the greatest TV shows of all time over the course of its seven-year run. You'd be hard-pressed to find much of that greatness in the first season, which is alternately cheesy and self-serious. Compared to what the show would turn into by the end, however, the first season's freshness and energy is delightful, and some of the episodes are actually pretty good on their own terms. For those somehow not familiar with the premise, Star Trek follows a group of human space explorers as they fly from planet to planet, interacting and often clashing with the myriad species that inhabit the galaxy. Humanity has reached a point of near-utopia, when the only threats to harmony generally come from outside the Earth-centered Federation. Following this template (which later Treks would deviate from), The Next Generation is a very optimistic show. Almost every episode ends happily at this point in the series, with Captain Picard and crew offering liberal doses of human goodness to cultures that are saddled in one way or another with problems analogous to our own. Later episodes would take darker, more imaginative turns, but for now The Next Generation is still bright, sunny, and mildly predictable. The problem with the first season is that it sticks far too closely to the original show. Gene Roddenberry's original vision was to reproduce original Star Trek episodes almost verbatim but with the benefit of 20 years of special effects improvements. Early episodes which stick to this vision, like The Naked Now, are some of the series' worst. Once the show develops its own identity toward the midpoint of the first season, things get much better. It starts moving toward its latter-day identity as a show where minds, not weapons, offer the solutions - in other words, a more interesting series. Patrick Stewart's Captain Picard is a far more level-headed, risk-averse commander than the original show's Captain Kirk, which sometimes makes for less exciting solutions. At this point, clean-shaven first officer Riker doesn't provide a foil, so what we get are two stiff careerists at the head of the show (later seasons distinguish the commanders). Most of the other characters are ciphers, except for Brent Spiner's android character Data, who is awfully demonstrative for an emotionless robot. Most of the flaws here are just typical first season shakes, which will settle down later. Highlight episodes include the two-hour pilot, Encounter at Farpoint. Though the characters are undefined and the performances are often sketchy, it serves up one of the finer puzzles of the series. Hide and Q is a cool answer to the original series' Where No Man Has Gone Before, with Riker being tempted by godlike power - plus you get to see the annoying Wesley Crusher bayoneted. Home Soil offers an interesting speculative plot. Skin of Evil has a plot stroke that was extremely audacious at the time and still seems slightly shocking today - the sudden, inglorious death of a main character. ...The first season made it seem like this series was going to be a bad joke. I remember excitedly waiting for the pilot episode to air (I was in 9th grade), then after viewing it thinking "What the $&! * was that garbage?!". 1) The writing and acting- The scripts in this season were terrible. Of course, the writers were trying to 'find' the characters, which takes time. However, if you compare they way the characters act in later seasons to the way they act in the first season, its almost as if they are different characters! Picard is nationalistic (France), prone to outbursts, and displays none of the quiet, conflicted self-assurance that would make the character famous. Geordi is almost completely one-dimensional, and Riker is prone to extreme overreactions at odd times (Jonathan Frakes would later get a handle on this). Troi is annoying to say the least, and Data's dialogue is more aimed at establishing his character than working within the stories. Wesley is portrayed so sickenly wide-eyed and innocent (with the whole life journey just starting out schtick) that it ruined the character for most Star Trek fans (and Westley is still the most hated Star Trek character of all time). In addition, many of the worst episodes of the entire series are found right here in season 1. Very juvenile and underdeveloped storylines, utterly terrible dialogue, and the infamous 'planet of the joggers' and 'Yar's pointless death' episodes makes for a pretty bad season. Who would have guessed this series would rapidly improve to perfection? 2) The Ferengi- Need I say more? THESE are the big new villians to rival the Klingons and the Romulans?! Thankfully, the mistake was recognized fairly quickly, and the Ferengi were relegated to their rightful place as comic relief. 3) The costumes and the bridge- OK, this might just be a personal grudge of mine, but I HATED the jumpsuits of the first two seasons. Men do not look good wearing jumpsuits, they just look stupid. Why it took two whole seasons for the wardrobe department to figure this out is beyond me. Once the separate shirts started being used, the uniforms looked GREAT, but the jumpsuits were god-awful looking. And what's with the chaise-lounge bridge chairs? If they reclined any further, they would be beds! A pretty stupid idea, thankfully the bridge was redesigned later. 4) The lighting- Has anyone else noticed how badly lit the first season was? Picard's chrome-dome shines, Geordi's skin shines, the bridge lighting looks extremely harsh, and the soundstage 'outdoor' sets are obviously lit with artificial lighting. These problems would be corrected in season 2, with the series eventually being a model for how to light a set PERFECTLY. All in all, Next Generation is a FANTASTIC series, one of my all-time favorites. However, season 1 is far and away the worst season, bordering on embarrassing. Season 2 fared better, and every season after was at the very least EXCELLENT. For completists, this season may be a must-buy, but for casual Star Trek fans, avoid the first season and start with season two. This show blows Star Trek: The Original Series, out of the water! Star Trek: The Next Generation, is one of the first T.V. shows I ever got into. It had awesome special effects for its time. The cast of characters was great. A wide and diverse variety. Capt. Picard, the bald, child-hating, strict captain. First Officer William T. Riker, ever the ladies man. Data, that lovable android. Geordi La Forge, the blind engineer (or in this season, Chief Helm Officer). Deanna Troi, the Betazoid counselor. Worf, the warrior Klingon. Wesley Crusher, the know-it-all. And, lastly, Beverly Crusher, the pretty and smart doctor. Here is a quick overview of the episodes. I'll rate 'em, too. Lonely Among Us - You know...I can't even remember this episode. ? This dvd set is very overpriced for its contents and video quality.. that's what I think.. When it first appeared in 1987, I was skeptical that this series could ever equal the first.So I ignored it for a while. I remember when this show started being aired here,i was realy interested to see how it would go.After a while you sort of get addicted to it,and you understand how it gained such a huge following.Great cast,they all did a fine job with their characters.The scripts were interesting as well,always something new and exciting.It followed the original series quite well.I felt that some of the other spin-offs realy went too far with costumes at times,and realy didnt capture my imagination as well as both the original,and TNG.5 stars for every season of this series,and its a good thing there is so many of them. Although some people feel that season 1 was the worst season for TNG, I thought that it had some great stories. Some of my favorite TNG episodes are from season 1. Althought the cast is not yet at their best, it is still good acting and some of what is actually future character development I think is mistaken as a bad portrayal of the character. Season 1 has a lot of good stories and some truely great stories as well. As for the DVD representation, I was not disappointed at all. The menu system looks good and is easy to operate. The picture quality was good. I have read some reviews that say the picture was too dark, but I would have to disagree with these reviews. And I personally like the fact that it was not done in widescreen since it was originally broadcast for television, not widescreen. I was most impressed with the sound quality which is excellent. 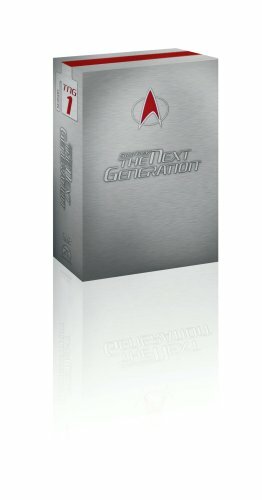 Season 1 is packaged in a box with a brushed metal look to it which I think is quite sharp. When you open the box you will find that the inside front cover lists all the discs and what episodes they contain. This outside box contains a fold out book of sorts which holds all the discs plus a booklet introducing the main characters as well as listing the season 1 episodes. Although the disc container book seems a bit awkward, it does look nice and it all has the added advantage of looking impressive sitting on the bookshelf. Especially if you have all seven seasons! The product is well organized and well packed. The quality of the image is not great but I guess this is the quality of the TV images in the 80s. Star Trek The Next Generation-Season 1 is the season that started it all for TNG fans. It's jam packed with 25 episodes that tell entertaing stories and is what inroduced us to the 24 century. Patrick Stewart was great as Captian Picard. I can't think of anybody else that could have pulled off what he did. I think he's just as good as Kirk and Stewart carried the dramatics so much better than Shatner. This is the season in which Deanna Troi wears the cheerleader uniform and has the big 80's hair. It's always nice to see someone's beginnings. She wasn't all that hot then, but I love what they have turned her into. Brent Spiner plays Data so well. He was suppose to be TNG equivalent to Spock. He does a good job as the android who wants to be human. That isn't always an easy role to play, because the character is baby like and raw. I love Data's beginnings. Michael Dorn has a good job as Worf. He was always my favorite character in the show because of all the agression he always showed. His character is a little minor in this season because of Tasha Yar. I wasn't that big of a fan of Yar, and I'm glad they took her off. It let them do so much more with Worf. I loved Geordi La Forge. Levar Burton did such a good job with him. It's the best character he ever played. Geordi's one of the coolest nerds I've ever seen. I had Seasons 4-7 for a couple of years and I finally broke down and bought season 1. It was really great to see how "green" the crew was and the opening with Picard's dialog. A lot of people, like myself, have overlooked the first three seasons as a settling in period for the characters. But when I looked at season one I was glad I had purchased it. What thrilling time to see this crew pull together. It was like seeing old friends for the first time in years. The newness and freshness of the characters survives the years in this first season DVD. Star Trek the Next Generation was one of the greatest shows in television history. But it certainly didn't start off that way....at least in my opinion. The pilot episode, "Encounter at Farpoint" was written by Gene Roddenbury, the creater of both Star Trek series. That should be a plus...right? Sadly Roddenbury's left-wing leanings show up more than his brilliant writing skills. He uses the eposide as a soap box to rant against humanity and anything that is traditionally acceptable. A marine uniform is referred to as "a rediculous costume". Besides the questionable politics, the episode is just silly. An excellent addition to any science lover's collection! On July 29, 2008, I discover that the illustration on the ads for STTNG Season 1, 2, and 3 has a close box yet you can still get these sets in one day. On May of 2008, I order Season One and the picture show the open box with all seven DVD's. This may sound silly but I also purchase "Star Trek: The Undiscovered Country" a few months ago and what I got was two disc with no display on either one of the disc and no extra material that I have with my other Star Trek Movie Collection. It is also stamp on the back Made in Mexico. I am only concern that when I get the 2nd and 3rd seasons of STTNG that it will be like the movie. This could be the reason why they show a close box. If anyone can check this out please let us all know. I have seen these episodes so many times over the past twenty years and then lost the ability to watch them. It is with great pleasure that a show from my childhood is finally all on DVD! I was always mesmerized by the variety of storylines, the technology (especially the holodeck! ), the struggles they faced in outer space, as well as how much better the graphics are when compared to the original series. I had seen the later seasons, but never the whole first season. And it is great ! Of course, in 2006 things seem to be going a bit slower than they would today (eg the seperation and re-connection of the disc in the first episode), and of course not all the sets are equily fantastic, but for the '80's they are fantastic ! The specials are also very informative. Getting the actors to comment on the first season years later was great. It being the first season the actors indeed still have to find their way, in the show, in their character and with each-other. It's great so see how it all began, though. Picard seems a bit more agressive than he was/is later in the show. Deanna's hair is always a treat ;-) And also nice to see that miniskirts are not yet completely banned; the first glimpse we had from the Ferengi (with Armin Shimmerman, who later on plays Quark in DS9); Q, always a lot of fun. It was not until the 3rd season that I gave it another try, when the characters were established and the far more mature character of the show was evident - less military, more culturally sensitive and diplomatic, with the addition of full families on board. Indeed, it was only when I came across it by chance, while starting a career and in need of a break, that I saw the incredible quality that had emerged. All the characters, beyond the absolutely first rate Patrick Stewart, had evolved and cohered into a believable team. That being said, while my wife and daughter are watching this season again, for the most part I feel no desire to sit with them, but can listen from my perch at the computer (i.e. right now).